Synopsis: A dramatization of the CIA’s ten-year effort to capture or kill Osama bin Laden, as seen through the eyes of the investigators who tracked him in Islamabad, Pakistan and the members of SEAL Team 6 who stormed the Abottabad compound and brought him down. “I don’t want to talk about 9/11 yet,” says Daniel Stanton, the CIA’s man in Islamabad, while standing in front of a Pakistani prisoner at a CIA “black site” during the opening scenes of Zero Dark Thirty. Yet before even these lines of dialogue have been uttered, the film has already presented a series of ghostly, recorded emergency calls from that tragic day against a black screen. The anger and grief of the disaster are replicated in Stanton’s (Jason Clarke) fiery interrogation methods, and one has to wonder whether such retaliation can be construed as vengeance or justice in light of the way his victim, Ammar, trembles when given an orange soda, likely his first in months, a few scenes later. “This is what defeat looks like,” Stanton says in the interrogation room. As we come to see over the course of the film, it is even more troubling to imagine what victory looks like. 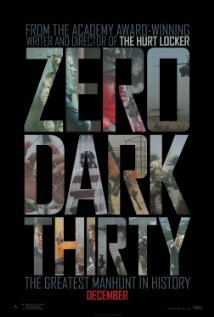 Wavering between replication and re-imagination, Zero Dark Thirty takes journalist and screenwriter Mark Boal’s thorough reportage and infuses it with a kind of dramatic sealant, filling in the spaces between the known with crackling dialogue and a sense of veracity unmatched in recent historical fiction. The film concerns the CIA’s protracted hunt for Osama Bin Laden from 2003 to his eventual death on May 1, 2011 during SEAL Team 6’s daring (and rendered in chilling detail) raid under Operation Neptune Spear. Director Kathryn Bigelow is careful to elide or punctuate certain historical events in order to bring a ten-year narrative up to speed as a breakneck procedural, with one suspected associate of Jackpot (Bin Laden’s codename) after another leading Islamabad rookie Maya (a steely-eyed Jessica Chastain) and her team down an ever-widening rabbit hole as they struggle to keep from losing the scent. Maya herself proves a cunning, cautious soldier whose battlefield lies indoors, behind a desk stacked high with video monitors where she replays security footage from previous interrogations of supposed terrorist agents. She is also a true asset. In short order, she gains the confidence of her boss (Kyle Chandler) and begins to dress in Pakistani garb, including a black wig to conceal her vibrant red hair, in order to get under her subjects’ skin. She enters the fray already deeply immersed in the history and lore of the U.S. global security effort, able to rebuff a fellow teammate’s suggestion to buy off an Al Qaeda agent as something that “might’ve worked during the Cold War” and riposte by gleaning the name of Abu Ahmed, one of bin Laden’s couriers, from a prisoner as a potential lead. Along with Stanton, she performs the role of the good cop and gets results. More importantly, she seamlessly integrates herself into a sweat-choked, barbed wire CIA landscape that is otherwise dominated by white American men with large guns and bearded, black-eyed Pakistanis in orange jumpsuits. Her call to action is the death of a friend and colleague, one of the few women on the base in Pakistan, seven years into the hunt. A supposed source close to bin Laden is allowed onto a forward operating base and promptly detonates his vehicle, killing six other CIA agents in the process. For Maya, it is the final straw. Already her country has been scarred by an act of terror, the death of her friend sending her into despair so deep she cannot but curl against the cloudy glass by her desk and cry. It is an archetypal moment for Maya, her image reminiscent of classic heroic figures brought low by circumstances that threaten hearth, home and self all at once, like Aeneas upon his flight from Troy. In undertaking the quest to find bin Laden, Maya takes on the burden and questions of American society itself: can we end terrorism, and at what (further) cost? Like Aeneas, Maya rallies herself, and the narrative changes irrevocably from one of patriotic duty dictating a quest for redemption to a story of revenge, blood simple. “I don’t really care if your guys get sleep or not,” she says to a Special Activities Department officer (Edgar Ramirez), and we get the sense that this is not the only aspect of her colleagues’ comfort she deigns to respect. Maya internalizes the national conflict that drives the first half of the film, taking the news of her friend’s demise much as the audience does upon hearing those first miserable voices crackling over phone lines from the World Trade Center — a call to arms. “I believe I was spared,” she says, “so that I could finish the job.” Unfortunately, her renewal of conviction arrives just before the Islamabad station chief informs her that bin Laden is no longer the number one priority for the CIA in light of a series of devastating attacks across the globe, the need for prevention overriding the game of terrorist Whack-A-Mole. Her services, it is implied, are needed elsewhere at the moment. No sooner does she ignore this advice in pursuit of her initial prime suspect than a squad of men with submachine guns assault her at the main gate of the Islamabad office, no doubt due to her prying eyes. The attack confirms her suspicions. Yet while her brush with death serves as an affirmation of the proximity she has attained to bin Laden, it also tests her mettle in ways that can be described only as heroic. It is one of a series of personal trials that occur throughout the second half of the film — Maya’s half — including a run-in with CIA director Leon Panetta (James Gandolfini) and the nail-biting wait as she unzips bin Laden’s body bag at the end of the manhunt. Maya’s failures are America’s failures, her success the same. In her are embodied the hopes and expectations of entire branches of American government, honed razor sharp by a decade of searching. By the time the story shifts yet again, to a night vision-aided run through bin Laden’s armored compound based on firsthand accounts of Operation Neptune Spear, the mythic mode reaches its nadir. The final scenes are a song and dance around a campfire, an invocation of warrior myth clad in the high-tech accouterments of the most advanced weaponry and equipment the Army can muster. The reality of the event is certain, owing to the memoirs available, which allows the reconstruction to shine without embellishment. What begins for the viewer as a CQB scene with famous players terminates as a story itself, a cinematic spectacle that begs to be shared with others in hyperbolic terms. Though the action is sparse, the telling is tight — it is in the genesis of retellings that the scene, as does myth, becomes something greater than the sum of its parts. It is hardly necessary to overstate the power of film to shape society in the context of Zero Dark Thirty. Already there have been outcries by prominent politicians that the film not only promotes and avows the use of torture — “enhanced interrogation techniques,” in White House press-machine jargon — but also falsely implies that information gleaned through the use of such techniques led to Osama bin Laden’s death. In effect, critics and detractors seem to be tacitly arguing, the film’s most offensive and loathsome feat is its rearrangement of the American myth of the global war on terror, so carefully constructed before the film’s release shook things up. While the suggestion that the film peddles fiction as truth is proof enough of some deeper partisan gerrymandering outside the realm of Hollywood, the film’s muddling of fictional and journalistic elements can become especially confusing at times. Interspersed with vitriolic CIA boardroom confrontations between Maya and her colleagues and scenes of suicide bombs exploding in the streets are idyllic snapshots of everyday life in Islamabad — bustling outdoor markets, cats slinking through cracked palisades and kufi-wearing children playing cricket in a narrow lane of white gravel. Like any good piece of journalism, equal weight is given to the depiction of Al Qaeda’s Pakistan and the Pakistan removed from violence. The film could be called mythic, a parable that condenses and homogenizes the nervous terror that has gripped the United States for over ten years. The film does not advertise itself as the sole purveyor of hidden truth, nor does it carry the eye-roll-inducing disclaimer, “based on a true story.” Instead it relies on realism, viewing much of the action through a handheld camera that sways and breathes with the characters it captures. At its finest moments, the film works on a gut level, channeling all the manic action of a restaurant rocked by a suicide bomb’s explosion as effectively as a CIA superior’s fist slamming the boardroom table when ordering his people to find more “people to kill.” The intersection of fact and fiction is foggy in Zero Dark Thirty, but the results are highwire-taut and overwhelm the urge to ask questions about the authenticity or neutral bias of the film. When Maya climbs aboard a cargo plane in the final seconds of the film, informed that she is the sole passenger and that she can go wherever she likes, instead of replying she stops, takes a moment, and weeps. 1 – Boal, who has been embedded in the Middle East since the turn of the century, already possessed a solid enough base of sources and published pieces to his name (The Kill Squad, an April 2011 piece about U.S. soldiers who murdered Afghan civilians, ran in Rolling Stone) to conduct research for an entirely different film revolving around the Battle of Tora Bora in Afghanistan. When news of Osama bin Laden’s death reached the filmmakers, the filmmakers dropped the Tora Bora project and used Boal’s information and contacts to begin constructing what would become Zero Dark Thirty. 2 – In one scene, she plops down on a couch after a day of investigation, strips a burqa from her head and eats a candy bar, Converse sneakers visible underneath the hem of her long dress. 4 – A more extreme version of this levity can be seen when Stanton catches a CIA higher-up in the act of Islamic prayer upon entering his office. Whether or not there are Muslim CIA directors is taken on faith in this case.